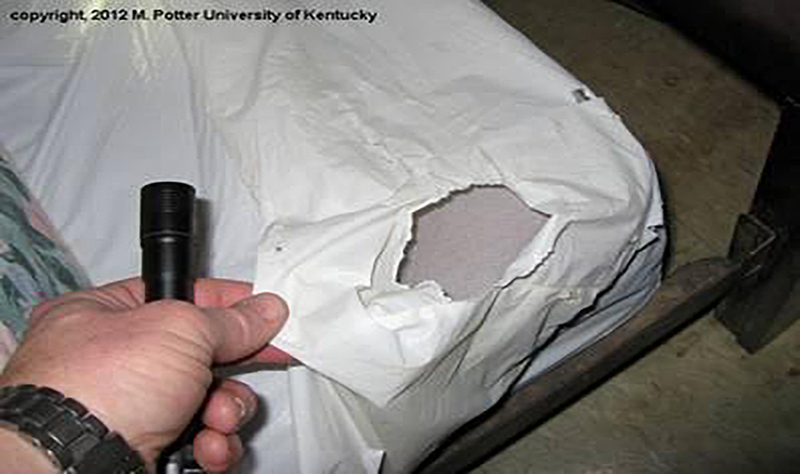 Product manufacturers and pest management professionals (PMP) typically advance the narrative that mattress encasements serve a role in bed bug prevention. While encasements serve as a tool in the PMP’s toolbox for assisting in the prevention of progression of bed bugs by limiting their ingress and egress from the bedding covered, the primary function of the product is it protects the asset (the mattress.) The asset protection function of the product is also limited to integrity of the encasement. Since encasements have no insecticidal component that kill bed bugs, their usefulness is limited to protecting the mattress from stains, preventing bed bugs from creating harborage sites on the new mattress and keeping bed bugs that are encased in an existing mattress from escaping. The hotel must understand the limitations of encasements and cannot rely on the manufacturer’s marketing narrative that encasements prevent new introductions of bed bugs or remediate existing bed bugs that are not trapped within the product. Therefore, reliance on any marketing information or implication that encasements can serve as a standalone bed bug prevention device is grossly misplaced. While a hotel that is sued in a bed bug case may tout the proactive use of encasements within their property, even a novice lawyer will be able to dismantle their usefulness in terms of bed bug prevention by appealing to the judge’s or jury’s common sense. This is not to state that encasements are not useful—they are—the point is that they serve as one limited component in an overall integrated pest management (IPM) bed bug preventive strategy. The other limitation not often appreciated is that encasements are only useful so long as their integrity is intact. For instance, if the encasement has a tear, the product itself is not only useless as an asset protection device, but may likely serve as a harborage site for bed bugs. This reality places a duty on the hotel to conduct frequent inspections to assure the product is intact and not otherwise compromised. Even a slight tear in the mattress will serve as a harborage and future epicenter of a new infestation. A good PMP needs to correctly apply the product and/or educate its customer on the correct way to install the encasement. The customer needs to understand the immediate need to contact the PMP once the encasement is compromised, even if only slightly. Understanding the role of encasements in the world of IPM and their limitations is important. The encasement kills and exterminates absolutely nothing. The PMP has a duty to educate their customer on the difference between asset protection and human protection. A bed bug that hides in the headboard, footboard, carpet, behind the molding or couch will still be able to have the same access to its host with or without an encasement. The legal implication of relying on them as a standalone or primary preventive measure will surely land the hotel in legal turmoil. —Jeffrey M. Lipman, Attorney-At-Law and Polk County Magistrate Judge.